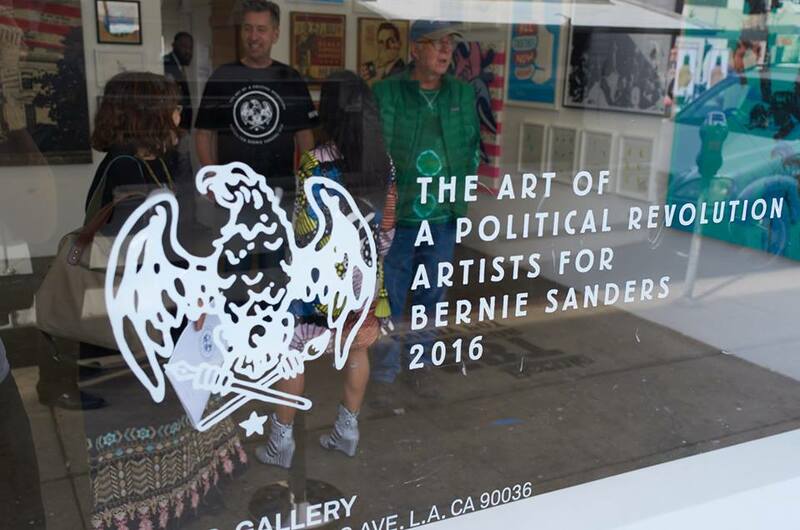 In Los Angeles but ending this weekend, you can check out an #ArtistsForBernieSanders show in support of Democratic presidential candidate Bernie Sanders. My beautiful friend Souris Hong is one of the curators/organizers/promoters, and you should really read her personal story of involvement. “I live in a country where I can come from a refugee camp and end up on the campaign trail,” she writes. Included in the exhibition are artists and performers we've blogged about here at Boing Boing over the years--Kozyndan, Ron English, and Shepard Fairey among them. The organizers plan to take the show on the road to more cities, when the Los Angeles kickoff closes. 'The Art of a Political Revolution' at HVW8 features visual artists and musicians who “hope to inspire change throughout the nation.” Rad. Participating artists include: Aaron Draplin, Amanda Marsalis,Atiba Jefferson, Brian Lotti, Bryan Blue, Byron O’Neill, Charlie Becker, Claw Money, Cody Hudson, Dan Buller, Dave Kloc, Donny Miller, Dug Nap, Dylan Fant, Ellen Voorheis, Erin Garcia, Greg Auerbach, Hayley Starr, Heidi Hartwig, Jackson Tupper, Jamal Gunn Becker, Jeremyville, Jermaine Rogers, Josh Maupin, Kozyndan, Michael Vincent Laviolette, Mtendere Mandowa ‘Teebs’, Nathan Bell,Patrick Martinez, Richard J. Oliver, Ron English, Saelee Oh, Shepard Fairey, Sven Barth, Tyler Gibney, Zoetica Ebb. Music by following artists: Anthony Valadez, Carlos Niño, DJ JCK DVY, GLK, Hanni El Khatib (DJ Set), Inka One, Mark de Clive-Low (DJ Set), Money Mark, Nia Andrews, Peter Maxwell, Saul Williams, The LA Culture Ensemble curated by Computer Jay, with more to be announced. Kicking off in Los Angeles, “The Art of the Political Revolution” is set to be a touring exhibition featuring both artists and musicians seeking to inspire change throughout the nation. Senator Sanders has started what he calls a “political revolution,” driving one of the most successful grassroots political campaigns of our time. As Sanders continues to force the debate on critical issues affecting all Americans, artists are sure to play a crucial role in getting people to engage, learn and become inspired. Income inequality, climate change, racial justice, immigration, and affordable education, are just some of the hot button issues that serve as the inspiration for these works from both international and locally acclaimed artists included in the show. Limited prints of artwork found in the exhibition will be sold on Bernie Sanders’ website, with all proceeds donated to Bernie Sanders 2016.